Ever since my stepdaughter and I completed a mermaid craft kit together, I’ve been plotting to do more crafts with her since we had so much fun. Egg carton creatures seemed like a perfect project. The cost of materials is small and we eat a lot of eggs because, as you may already know, eggs are my favorite food. The possibilities are infinite. Plus, as she gains confidence in making whatever she wants, her creations can get more complex. This first round of four creatures is a family according to Moira. The spider is the dad. The lady bug is the son. The large scorpion is the mom while the smaller one is the daughter. I try to keep back as much as possible so she can make her own decisions. She picks what she’s making, the colors, etc. I mostly stick to cutting out the carton bits (frankly, it’s a miracle I haven’t cut myself doing this), pouring paint, and making sure the brushes are clean before she switches to a different color and things are dry before they’re handled too much, ie. blood and mess patrol. Also, I made a pinterest board for it so she could get an idea of the possibilities. She’s four so she didn’t look at it for very long. 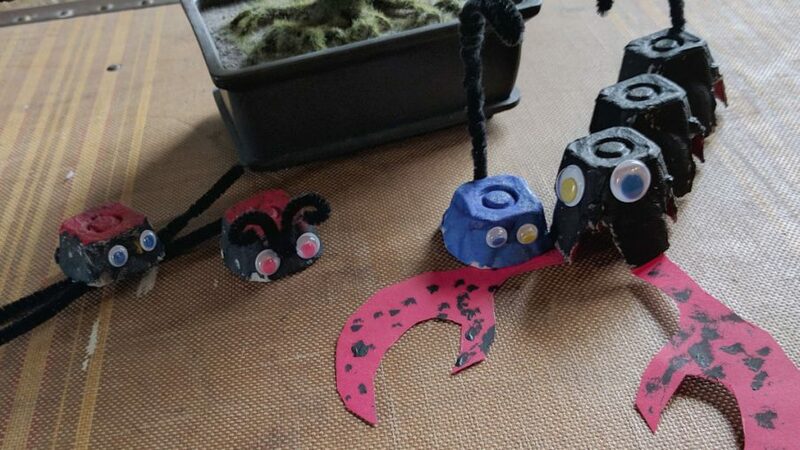 We made the lady bug and the spider on the first weekend. I made the mistake of pre-cutting out some legs for her. She insisted on chopping them down because they were too long (good call since she wasn’t going to bend them). 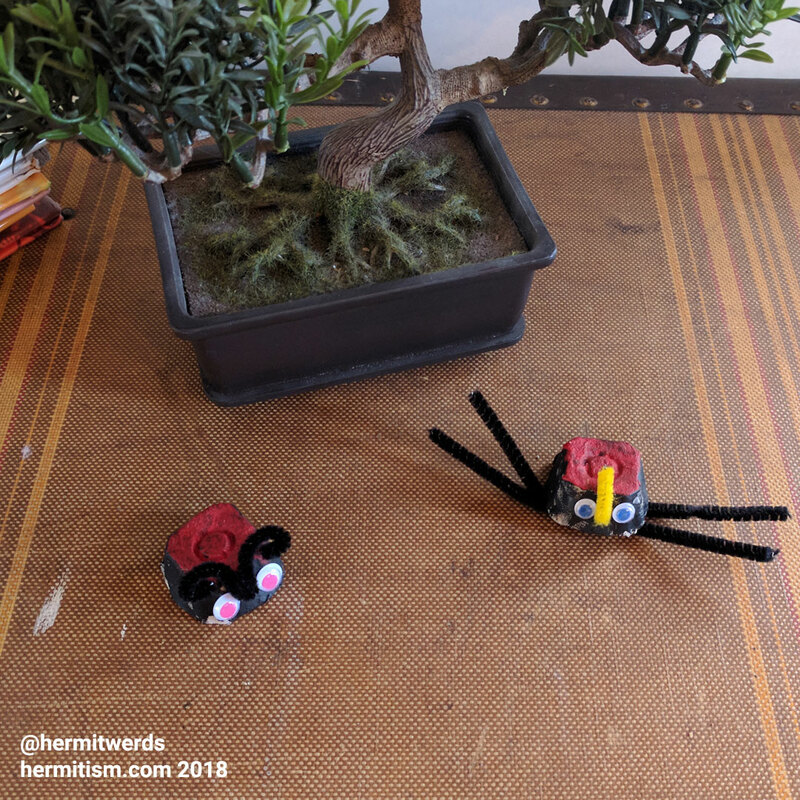 Then she decided she didn’t want to have eight legs for the spider (also a good call since we were just using the tacky glue and it was hard enough getting the legs to stick). She did accept some antenna from me and then glued on the yellow bit of pipe cleaner on the spider herself. Sadly, it fell off while she was playing with it in the car. 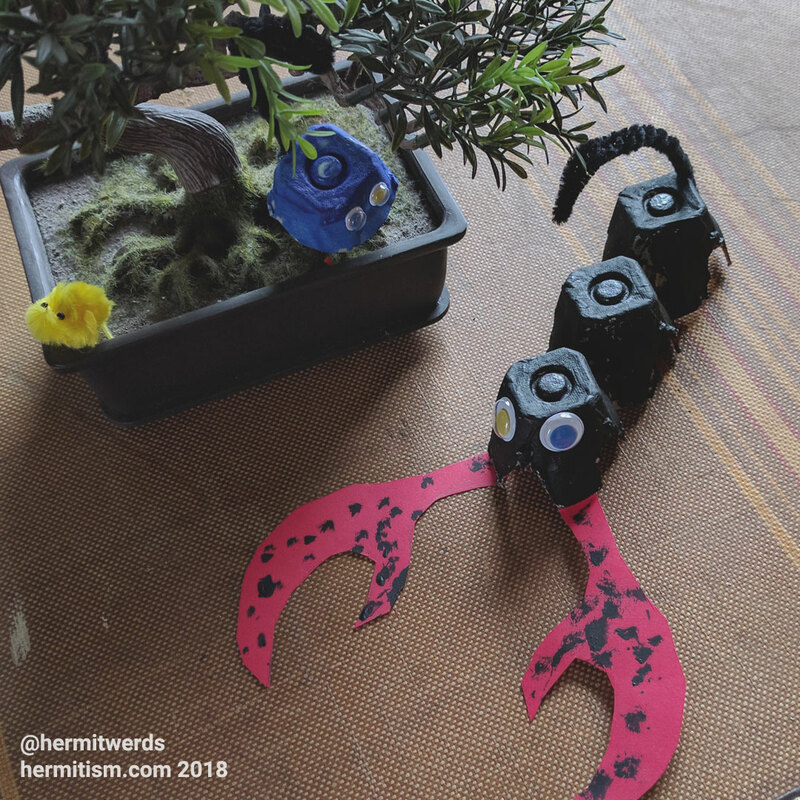 We’d already cut out the claws from red paper before I knew her lobster would be black and also a scorpion. Luckily, she’d already gotten black paint on them so I suggested she just add some more. Decoratively. Then we glued on the “crazy eyes” with the tacky glue and I used the glue gun to attach the tails. It would have been nice to have her put on the tail, but she’s not quite old enough for glue guns. 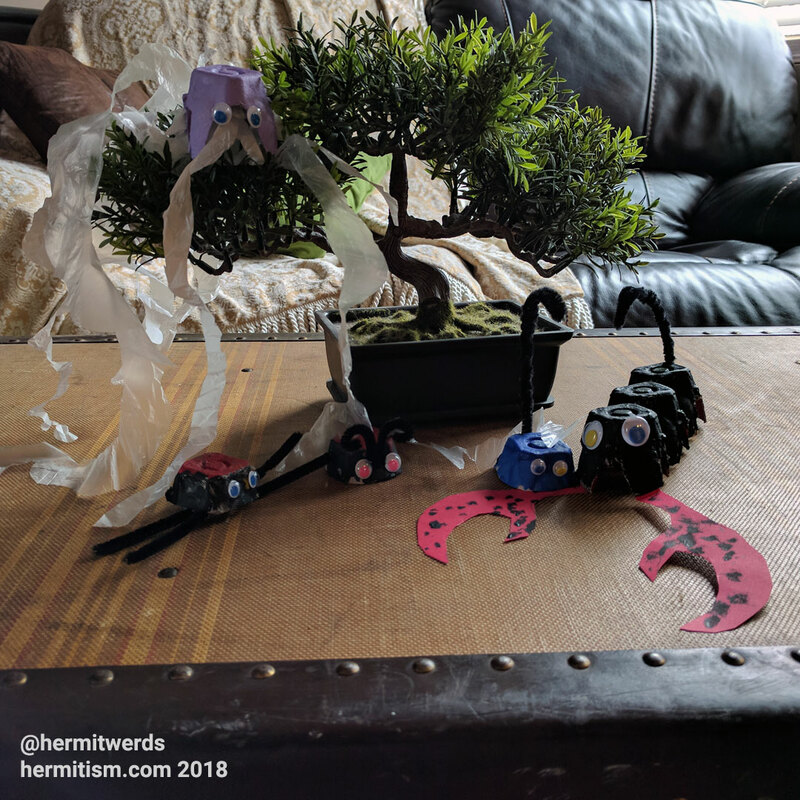 I was proved right about making the tails more secure since she used them to hang the scorpions on the tree while she was playing with them. Pretty sure they would have torn off with the weaker glue and not enough dry time. Anyway, I will be writing up a tutorial on how to make them as soon as I make a second one with a few changes. Gotta perfect my design!